One of the most widely celebrated holidays in the world, Chinese New Year has established itself as more than just a day – it’s become a booming season to celebrate and Bond Street is certainly joining the party. As our Chinese friends look forward to the Year of the Goat, it is that time of year again – beautiful fireworks, swirling dragon dances and amazing shopping at the world’s leading luxury boutiques. Furthermore, Mayfair shoppers can look forward to spectacular dining options at Asian restaurants celebrating the Lunar occasion this week such as Hakkasan, who invite you to see in the New Year in style. 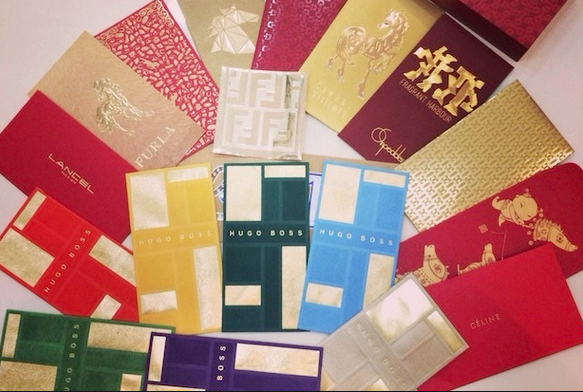 Stores on Bond Street are offering everything on-theme, from ram embroidered tote bags to Burberry’s stunning embellished scarf with Chinese inscriptions, and gift certificates are delivered as red money envelopes or hong bao in several of the global flagship stores. Kung Hei Fat Choy to one and all. It is one of those dank, winter afternoons, the kind you would expect to see in London during January. Apparently, it’s also ‘Blue Monday’ – though I’m highly sceptical of the scientific reasoning behind this, supposedly the most depressing day of the year. But no sooner am I inside Patek Philippe’s newly renovated store, than the dark clouds seem magically lifted. The lighting inside the Swiss watchmakers airy new interior is as close to natural daylight as you can get indoors. There’s even a specially created room fragrance, with warming citrus notes, which lifts my spirits further. The extensive expansion plan and makeover from the original premises at number 15 New Bond Street into the vast confines of number 16 next door, has taken over nine months to complete. 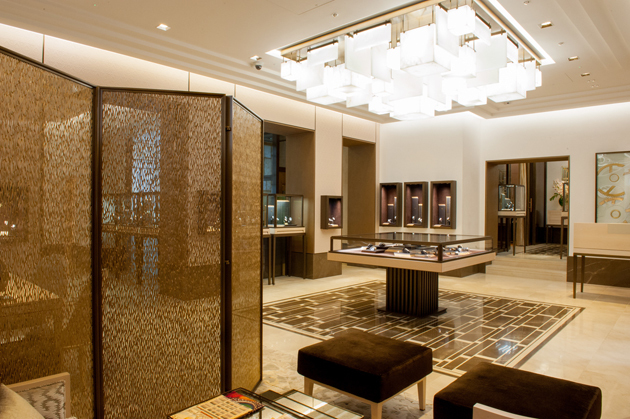 Having increased from 85 to 400 square metres, it is now the largest watch emporium on the street and houses pieces from the current collection as well as the Grand Complications and Haute Joaillerie designs. French design firm AW2 was behind the impressive makeover and took its cue from the Art Deco period. The main feature at the centre of the store is an impressive 2.6 square metre chandelier composed of alabaster cubes in various sizes, suspended from a bronze frame. Illuminated alabaster panels also light up the walls, which feature huge bevelled mirrors and abstract paintings in muted tones. Store director, Ed Butland, is showing me around. He speaks in gravelly tones, sotto voce, so as not to disturb the other customers who are in the process of choosing a watch. I’m shown a private room located on the first floor called The Celestial room. It boasts a large wood carved painting and has been created for clients who prefer even more of discrete shopping experience. Butland visibly shudders when I refer to it as the ‘VIP’ room. “I despise that term”, he says. “It gives precedence to customers when everyone who comes to shop here or browse, is equal.” Other words Butland dislikes include ‘store’, which he swaps with ‘salon’ – as in Patek Philippe’s London salon. A sweeping staircase leads down to the ground floor to a fully equipped state-of-the-art customer watch repair lab. Inside, two full-time Patek Philippe-trained watchmakers go about their business. They seem oblivious as we peer in at them through the thick glass wall, which divides their space with a plush customer waiting room. Dressed in static-repelling white coats and blue-coloured Crocs shoes I’m tempted to draw comparisons to Willy Wonka’s Oompa Loompas, without the orange skin colouring and taller, obviously. Butland’s voice drops another notch as he explains that no one is allowed to enter without donning protective clothing. If a speck of dust were to get inside the inner workings of a watch, then it would have disastrous consequences. Here in the viewing room/waiting area silence is golden. “When you come here to buy a watch of our calibre, you want to take time out of your day to relax with a glass of champagne and enjoy the experience,” concludes Butland. As for me, I could happily while away the hours watching the men in white coats as they breathe new life into treasured timepieces. A decade ago, Jewellery designer Raphaele Canot swapped her native Paris and a job as creative director at Cartier, to head the creative division at De Beers, London. Her office was housed above its flagship store on the corner of Old Bond Street and Piccadilly. Whenever possible, Canot would keep the French tradition of the one hour-lunch break at one of the local restaurants, or simply enjoy a stroll and some window shopping. Since leaving De Beers two years ago, the stylish jeweller finds herself back in her former stomping ground, after her eponymous jewellery collection launched at Dover Street Market last year. Isabel Marant is the best address for a chic Parisian fashion fix. The womenswear designer is a newcomer to Bruton Street and the store reminds me of my Parisian years, when I used to live on the Rue de Seine opposite her small, corner boutique. The insider French brand that became big, is always a great place for key wardrobe staples, pieces you can wear on the school run or to the office and then later to a cocktail party. Arguably the best jewellery store on Bond Street (and there’s plenty of competition! 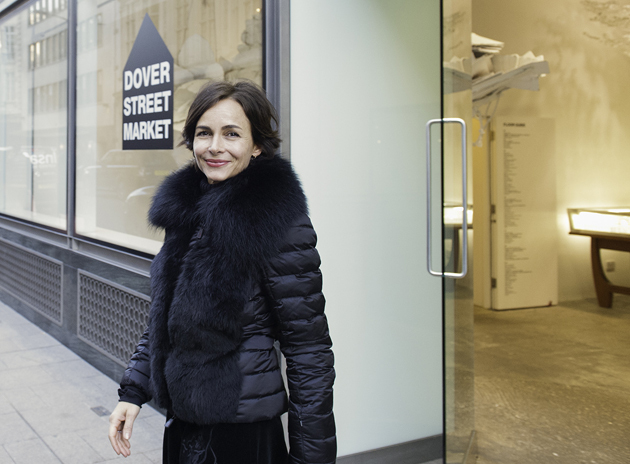 ), Dover Street Market is where you’ll discover a great independent label or build your wish list. It’s like entering a curiosity cabinet…talk about retail experience! I have always loved browsing the fashion and jewellery collections here, more so since they’ve become my exclusive retailer in London, New York and Tokyo. It gives me another excellent excuse to stop by and chat with the friendly and stylish staff – and pause at Rose Bakery for a snack. The ground and 4th floor are not to be missed. The café at Sotheby’s auction house is a great place for a late morning or mid-afternoon meeting. Everyone likes an arty and intimate environment. The service is always perfect and the chocolate truffles are the best on Bond Street. When I’m here, I like to take advantage of a spare 15 minutes in my schedule and browse the exhibition galleries. It makes me feel re-energised and lucky to live in London. If you are in need of last-minute gift inspiration, then head straight to the book department on the first floor. The expert edit of art, fashion and coffee table books is so carefully considered – with the added benefit of luxury packaging. It also hosts exhibitions and sells limited-edition pieces. Definitely worth a visit. The Obsidian gallery in Saint James is the best-kept secret among Cartier aficionados. The gallery is just a three-minute stroll from Old Bond Street but feels like a million miles from the world of luxury mega brands and extravagant window displays. Harry Fane, founder of Obsidian and an acclaimed Cartier vintage expert, has a flair for curating rare pieces in an intimate, decidedly British atmosphere. Having spent 11 years of my life at Cartier, I feel like re-entering the world of its secretive archives – where the art of jewellery meets the art of antiques. Last month, London Collections:Men, wrapped up its latest edition with a show of autumn/winter 2015 trends. 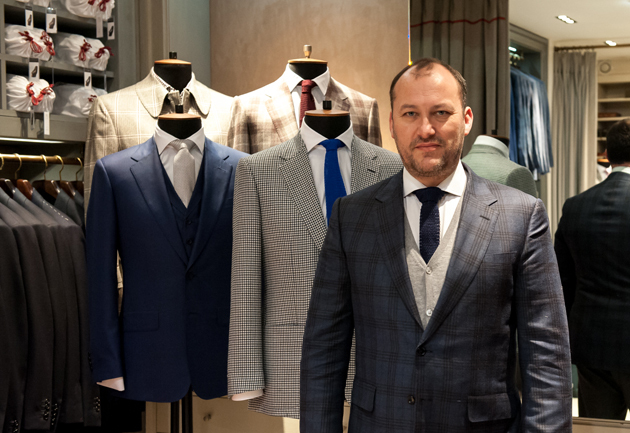 Amid the usual ready-to-wear labels, it was refreshing to see Britain’s sharpest tailoring brand, Lutwyche, showing on-schedule for the first time. As new kids on the LFW block, Lutwyche proved that it has the modern gentleman covered with a collection of Prince of Wales check suits, mohair blazers and cashmere coats – all cut to perfection. Tony Lutwyche, CEO and creative director for the label, which bears his olde English surname, is thrilled with the way business is going. “It’s been an evolution,” he says reclining in an armchair on the ground floor of his Clifford Street store. Housed in a prime location between Bond Street and Savile Row, it is a place where clients can buy off-the-peg-suits and jackets as well as accessories. These include traditional men’s shoes, specially designed for Lutwyche by Lodger – the British footwear brand bought by Tony in 2010. The workshop was purchased from its former owner in 2006. 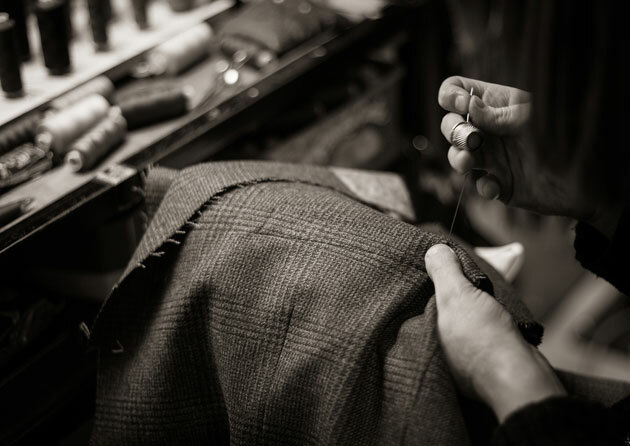 It was the last remaining factory-sized workshop in England to produce handmade suits and the only one still remaining today. No wonder this point of difference attracts such a strong international following, especially in the US, where the ready-to-wear line is now available at Saks Fifth Avenue in New York and Beverley Hills. Back in the UK, other stockists include the online shopping portal, Mr Porter. Tony’s career in tailoring began in 2000. From the outset he would visit his London clients in their work place, measure them up and then zip to his next appointment on his scooter. It is a far cry from his former life in the British Army, where he went the officer route becoming a Major in the Royal Lancers. 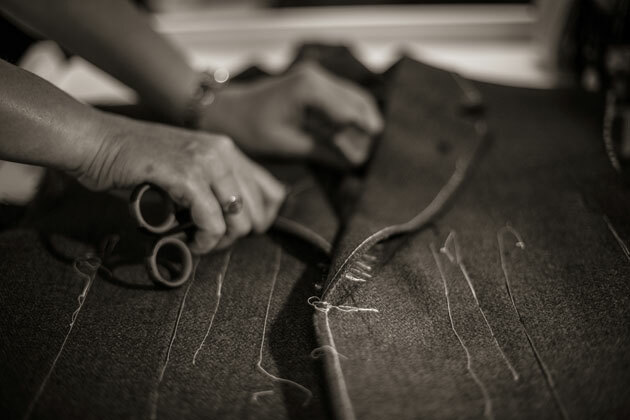 Still, a fair amount of military precision is essential when fitting a gent for a bespoke suit – something Tony likes to do as efficiently as possible. “One of the best things we have done is reduce the number of times we see a client by ensuring an exact measurement is taken the first time round.” And while this seems rather obvious to me, Tony learnt this lesson early on when one of his first clients, a surgeon told him: ”Surgeons and tailors are very alike. You should always measure twice and cut once”. So what of the future? Despite being always asked, Tony says he has no plans to expand the business with a lifestyle collection. “The core of our business is our workshop and producing hand-tailored pieces in England,” he says proudly. “I want to be the go-to brand for those looking to buy a beautiful suit or coat, so don’t suddenly expect us to dive into swimwear or anything else we see as irrelevant.” Trunk shows however are a must. Get ready St. Louis, Phoenix and Tampa. Tony and his measuring tape will be with you very soon. Where there is love, there is chocolate. 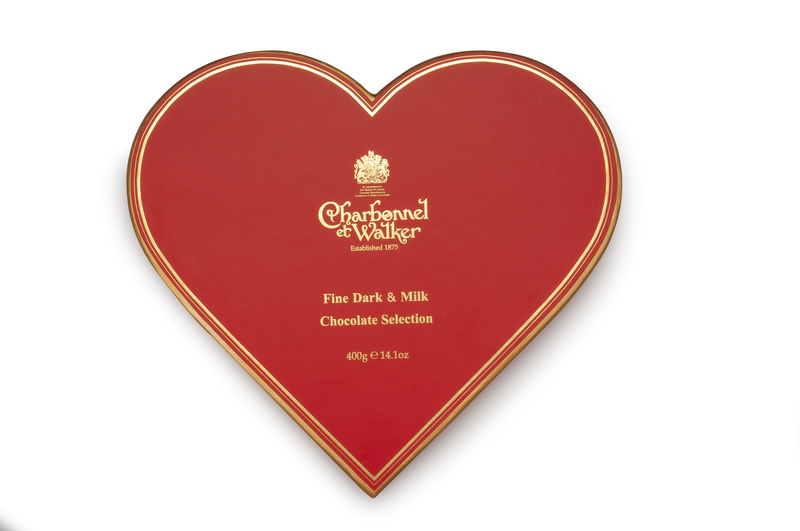 And at Charbonnel et Walker, London’s Royal Warrant-endorsed chocolatiers, there are plenty of heart-shaped chocolates and gift boxes to swoon over, this Valentine’s Day. The dark and milk chocolates contained inside this scarlet-coloured box (£38) are all made to Madame Charbonnel’s original recipe, which dates back 1875, when the business was founded. The heart-shaped sea salt caramels (£25) in its Heart of Heart box, will also hit the soft spot. Cupid, your work is done!